You are going to host a seder! You’ve already read Seven Things to Do to Make Your First Passover Seder a Success. Now you are getting ready to set the table, and realize you have to make a seder plate. Don’t panic! You can do this. THE PLATE – The plate may be your great-grandmother’s silver seder-plate, or it can be a paper plate from the grocery store. Truly. If you have a large, pretty plate, great, and if you don’t, just use a plate or platter or something. The point is to arrange some mysterious objects that will spur conversation and questions. If it’s pretty, good. If it is actually a bit weird, that’s not bad, either. Note: the things you put on the plate are to look at, and to provoke discussion. Those foods which you will eat, serve in regular serving bowls that can be handed around. The loaded seder plate will be a disaster waiting to happen if you try to pass it around. Think of it as a centerpiece, or conversation piece. KARPAS – Karpas is a green vegetable. It is supposed to remind people of spring. Parsley is often used for karpas; get a big bundle of it, put some on the seder plate, and put some in water glasses (sort of as you would flowers) to pass out, because the group will need to “dip” the greens into salt water at one point in the seder. The water will keep the parsley crisp, and it will be drippy with the salt water, anyhow. For more about the symbolism of parsley, read this. CHAROSET – (also pronounced ha-RO-set or cha-RO-sis).There are lots of good recipes for charoset. It’s nuts chopped with apples and sweet wine plus whatever you want. 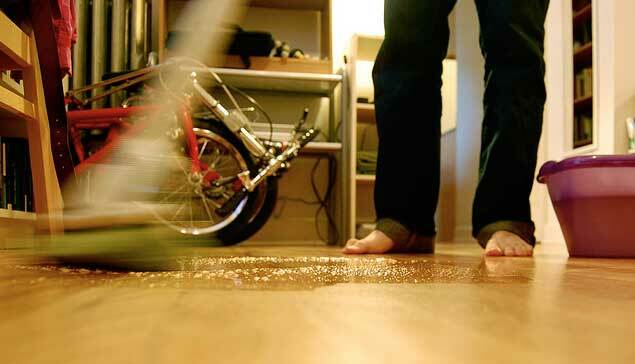 If you have guests who are allergic to nuts, have chopped apples with cinnamon. Put a spoonful on the seder plate. Since it is there to remind us of the hard work of slavery, you can shape it into a little pyramid if you like. (If your charoset is too runny to do this, you are putting too much wine in it.) Again, put the charoset to serve in bowls, and make more than you think you will need, because some of your guests will want lots. MAROR – Maror (mah-ROAR) is a bitter herb, to remind us of the bitterness of slavery and to fulfill the commandment to eat bitter herbs with the matzah. Many Jews use horseradish for this. Put either a spoonful of ground horseradish on the plate, or a chunk of horseradish root. You will want to have another bowl of horseradish to hand around to actually eat from. ZEROA – Zeroa is a roasted lamb shank bone. You can get these from a kosher butcher (and often from other butchers) right before Passover. Or you can save one from the last time you had lamb for dinner, clean it, and keep it in the freezer. This is in memory of the Passover sacrifice, back when we had the Temple. It is only for show. Vegetarians may opt to replace the actual bone with a beet root. EGG – Technically, this egg should be roasted. I have seen people do it by holding the egg, with tongs, in a gas flame until the egg turned odd colors (grey, brown streaks). I have also heard of people boiling the egg with some onion skins to give it color. Leave it in the shell. This egg is not fit to eat, it is just for show. It reminds us of the hagigah sacrifice, and of springtime. Many families eat hard boiled eggs as part of the Passover meal. HAZERET – This one is optional. Some families do it, some do not. It’s an additional bitter vegetable, usually romaine lettuce, for the Hillel sandwich. Families who do not put hazeret on the plate use the horseradish for the Hillel sandwich. 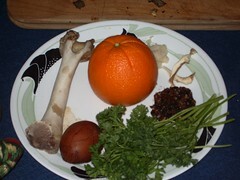 ORANGE – Some people put an orange on the seder plate as a protest against sexism in Judaism. You may hear a poignant tale about the daughter of a famous rabbi, who was not allowed to say kaddish for her father. That story is not true. For the true story, read this article. 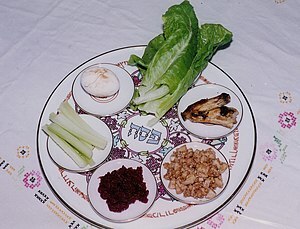 BREAD – Some have suggested putting a piece of bread on the seder plate to protest discrimination against homosexuals. Bread is used precisely because it is forbidden by the laws of Passover, just as Leviticus is interpreted to forbid homosexuality. However, this may be extremely problematic to anyone who expects there to be no chametz in the house, much less in the centerpiece. It might be more effective instead to have a discussion about marriage diversity at the table. TOMATO – Some put a tomato on their seder plate, in solidarity with agricultural workers in the U.S. who do not have to imagine what slavery is like. This article from the Jewish Week says more about that practice, and lists other objects which some people put on the seder plate. An editorial note: If you consider putting one of these protest items on your seder plate, please also take some actual action on behalf of the people who suffer. Putting a tomato on the seder plate is nice, but it by itself does not do anything for farm workers. Send a little tzedakah (charitable gift) to an organization that works for freedom of those workers, or works to relieve their suffering. The purpose of almost everything at the seder, but especially the seder plate itself, is to inspire questions and stimulate conversation. There are no “right” answers — perhaps in your discussion this year, you will think of a new way that one of these objects illuminates the story of the passage of a people from slavery to freedom. I wish you a Pesach sameach – a happy Passover!